This picture made me hungry. Strawberry: fruity, delicious, refreshing but still luxe. Perfect for layering, combining and continues to be full of surprises with every reinvention. It’s the flavor that started it all, drawing in a generation of lip smackin’ lovers. And it’s hard to imagine anything else being more versatile isn’t it? Not only the the iconic lip balm, but the mama of all balms 🙂 So in celebration of National Strawberry Month I plan on revisiting my (slowly dwindling!) stockpile of Strawberry Cupcake which also happens to be one of my most used flavors of all time. A family photo of my vintage strawberry patch eyeing up the newcomers. What is everyone else’s favorite Strawberry flavor? Do you prefer it simple or with a twist? I like original strawberry, strawberry kiwi, and strawberry watermelon the most. I know a strawberry limeade flavor was made in the squeezy collection, but has there ever been a strawberry lemonade flavor? If not, then they should make it. I would LOVE it! My favorite Strawberry flavor is Strawberry Cheesecake. I loved it from the first one I had back in like 2000. I was so happy when they started making it again. It’s funny how plain Strawberry is their original flavor, yet it’s never been a favorite of mine. I do like it though, just not enough to be a favorite. same here!! strawberry is great but this version isnt my favorite. its a little tart. but i love their versions of it like you said strawberry cheesecake! Not one of my favorites either, I like “Strawberry Banana” and I LOVE “Strawberry Fanta”. I been using the “Strawberry Milkshake” from the novelties set ALOT lately too. For me, no other Lip Smacker could ever top “Strawberry Kiwi Comet” from the 90’s. My mom & I both used it religiously & we’re forever in search of a similar formula. (Also, I have to still give a shout-out to my other favorite, Boysenberry Ruby. I’d give anything to have that back again, too.) ?? If you can hunt down the most recent Strawberry Kiwi in the original formula that was out, it’s the same as Strawberry Kiwi Comet sans the shimmer. Also, if you loved Boysenberry Ruby, get the Black Cherry Biggy. Reminds me exactly of Boysenberry Ruby! My favorite is Strawberry Coconut! There is some big news I found on Markwins. I pasted the article below. CITY OF INDUSTRY, Calif.–(BUSINESS WIRE)–Bill George, President and Chief Operating Officer of Markwins Beauty Brands will add Physicians Formula® to the roster of brands he currently oversees. This shift comes after longtime Senior Manager, Jeff Rogers, President of Physicians Formula®, announced his resignation in order to spend more time with his family. George has been leading Markwins’ growth in the beauty industry for the past seven years. His rise through the ranks at the company for the past 17 years has been fueled by his passion and ability to seize growth opportunities. In fact, George played a major role in a number of recent brand acquisitions including Physicians Formula® and Bonne Bell® / Lip Smacker®. Prior to this expanded role, George was overseeing the wet n wild®, Black Radiance®, Bonne Bell® and Lip Smacker® brands. • Accelerate brand evolution: Markwins to continue delivering the latest trends and beauty products to customers at an accessible price point. Most recent successes include wet n wild’s 1 Step WonderGel™ launch in January 2016; the industry’s #1 nail polish launch of the year, Physician’s Formula® Mineral Wear® Cushion Foundation, Lip Smacker’s Tsum Tsum; the brand’s prestige partnership with Disney, and Black Radiance’s unique True Complexion™ Match Me Foundation. This new structure will allow Markwins Beauty Brands to accelerate its industry leading sales of key brands by focusing its sales teams on key retailers and brand specific marketing plans, allowing the company to enjoy the best of shared services, while investing in initiatives to improve customer engagement and product innovation. The simplified and streamlined management structure will create a more thoughtful hierarchy and succession plan. Markwins Beauty Brands sales, marketing and supply chain teams will take the reins ensuring that the company will be positioned to provide better customer service and sales support, and well-poised for further acquisition. “This is the next logical progression in our ongoing effort to accelerate our growth trajectory and maximize value and service for our customers,” Bill George noted. Established in 1984, Markwins Beauty Brands is the largest privately owned cosmetics company in North America with a track record of acquiring brands and reenergizing their consumer appeal. In the last ten years alone, Markwins Beauty Brands has experienced triple-digit growth (+291%* from ’05-’15) across their portfolio of beloved brands like wet n wild®, Black Radiance®, Bonne Bell®, Lip Smacker®, and Physicians Formula®. In fact, for the first quarter of 2016, Markwins portfolio of beauty brands (EST. $403.8 Million total revenue in 2015**) is up 16.9%***YA, outpacing the total cosmetics industry growth (+3.9 %,) positioning the corporation as the 4th beauty brand supplier in North America. Mmm..I love Strawberries! I love the Fanta Strawberry one. Me Too! Fanta Strawberry and Strawberry Milkshake from the novelties are def my favorites. Bunny Cookie PLEASSSSSSE come back!! 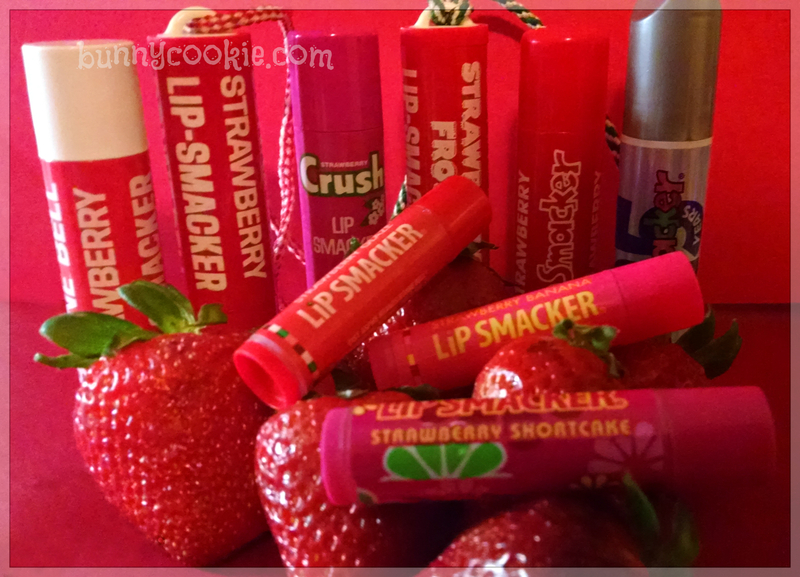 I know you’re not happy with Markwins but there were so many more amazing Bonne Bell Lip Smackers that I still want to see you post…PLEASE?!! You’re missed so much. Yes Miss Bunny Cookie. Your greatly missed. Markwins is seriously a horrendous money hungry company who makes subpar products. The Bells knew exactly who they were selling to. It’s really sad that Markwins is okay with ruining Lip Smackers 45 years of nearly flawless collections and authentic smelling flavors to make a few extra pennies. I wouldn’t be mad if some how the Markwins magically goes under. Did you see their latest scheme? They’re selling Coke branded lip balms at the Dollar Tree MINUS the LS label and making them in China. They look JUST LIKE Lip Smackers. Another way to get around Original & Best are made in the USA since they’re technically not O&B or LS. They are literally cannibalizing their own product line and branding. Complete idiots just to make a few extra pennies. So if you really can’t stand Markwins like me then don’t buy anything from LS, Physicians Formula, Wet n Wild or Black Radiance. Yes! I was at the Dollar Tree 2 days ago and seen the very lip balms your talking about. I am curious if they actually smell and feel the same as the LS ones made currently cuz let’s face it, quality has gone down a bit. Altho I did like the ” Garden Bouquet Collection” …pretty unique. Seems like they are hit n miss these days.